The Wolverines are ready for their best season since the days of Chad Henne and Mike Hart with 18 starters back. 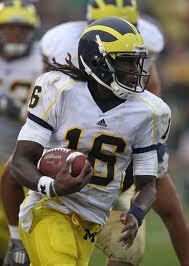 Denard Robinson returns after a strong season. He started off the season in the Heisman chase but struggled near the end. He can change the game and has amazing speed. People don't think he has a great arm but he can gain tons of yards in the air. The backfield is also an underrated unit led by tailbacks Michael Shaw and Vincent Smith. Maybe even senior fullback John McColgan can get some carries also. The receiving core is one of the best parts on this Wolverines' squad. Junior Roy Roundtree has great hands and also has nice speed, a dangerous combo against defensive backs. Along with Roundtree, Darryl Stonum and Junior Hemingway are the other options for Robinson in the pass game. Both are seniors and are ready for their best years yet. The offensive line may lose some talent but is still solid especially in the middle with center David Molk. Losing guard Stephen Schilling stings but the Wolverines don't even need to protect Robinson too well because he can work out of the pocket. The defense has never been Michigan's strong suit but it is decent this season thanks to 8 returning starters. Nose tackle Mike Martin stuffs up running lanes in the middle but the front seven lost the most talent without Greg Banks and Jonas Mouton. The linebacker core is very young without one senior starter but their is still hope there. 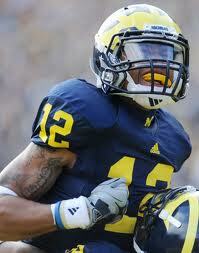 With the secondary Michigan has a strong anchor in the defense. Cornerback J.T. Floyd is strong and safeties Ray Vinopal and Jordan Kovacs are getting better. The special teams is decent too.